The slice of cake I made for you today has no calories. It’s a fun box you can decorate as a party favor or to fill with goodies or a gift card. The box is made from a die I’ve had for a while and it was time to use it. One of the great things about the Big Shot is you can use different kinds of dies from different manufacturers. I die cut the cake slice then embossed with the Finial Press Folder. I decorated the slice with doilies punched from the new Doily Triple Layer Punch, pearls and ribbon. I served up my cake slice on a circle scallop plate I embossed with the Perfect Polka Dots folder. 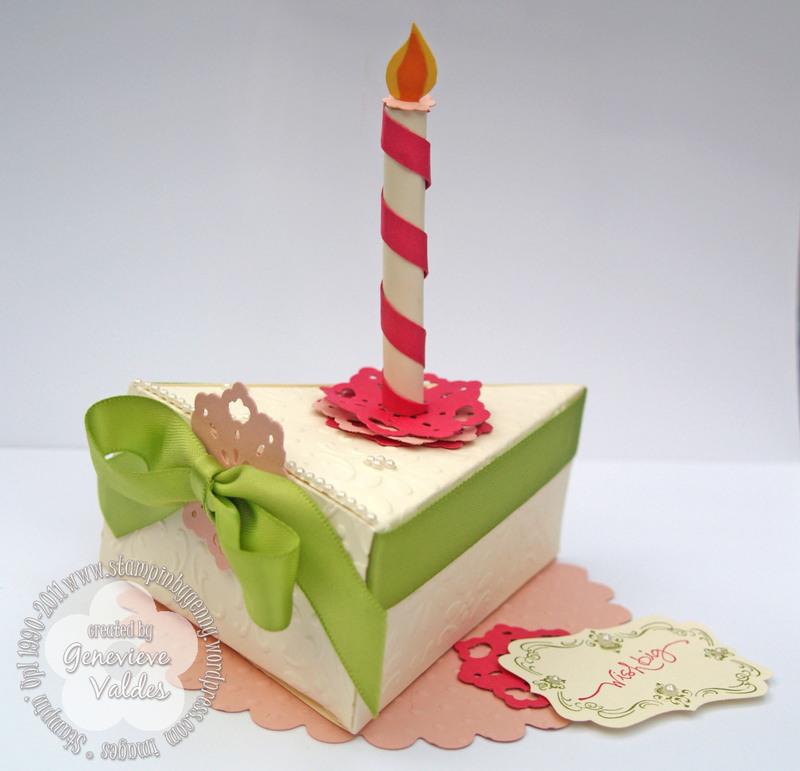 The candle is made with Very Vanilla card stock then decorated with a strip of Melon Mambo. I freehand the flame using Pumpkin Pie and Daffodil Delight card stock. Making this cake slice was a lot of fun. If you’d like to make a cake slice box but don’t have a die click here for a template. I have also entered my cake slice in the Piece O’ Cake Paper Craft Planet Tuesday 3D Challenge. Template: Click here for a cake slice template. Beautiful cake jenni! nice colors and thanks for the template.